We have just released a fully-redesigned version of the free Waterway Guide Marinas mobile app – now available for Android devices as well as for iPhone and iPad. 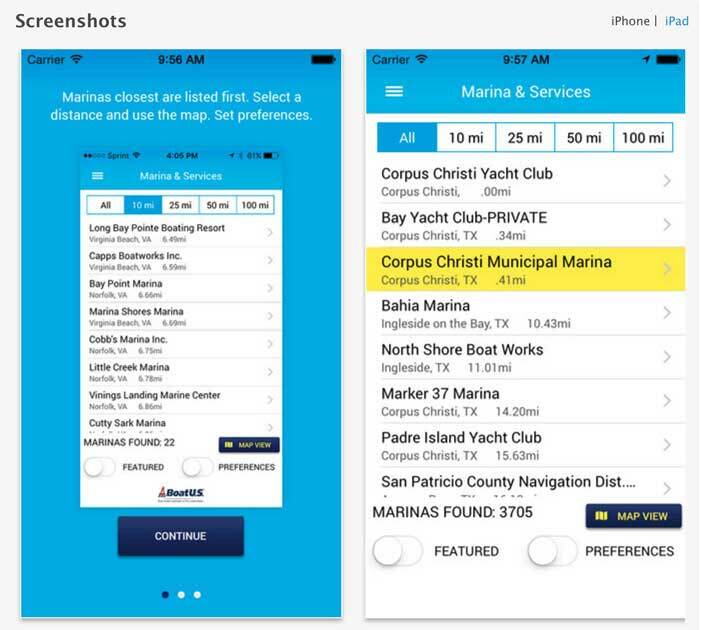 This one-of-a-kind app is simple and straightforward, yet powerful – it has all the information a boater needs when looking for a place to dock, stop in for fuel, or get supplies, repairs or other services. It's a quick and easy tool that lists only the marinas and boatyards that are nearest to you – set at 5, 10, 25, 50, or 100 miles (or "all") – plus service and amenity details for over 3,700 facilities in the Waterway Guide coverage areas. Need to find the closest fuel dock or pump-out? The preferences view can be now set to show the nearest facility that sells diesel, or gas, or both – or can show just the marinas with dockage that can accommodate your length, draft, or electrical requirements – or show you just the pet-friendly ones, or the ones that offer a courtesy car or restaurant, or the closest pump-out station – or any combination of these and other amenities. Once you find the perfect place, simply tap the phone icon to call to make a reservation. The new version also takes up less space on your system and takes less time to download; however, we recommend that you use a wi-fi connection when downloading the app to avoid using your mobile data. Delete the app from your device(s) (simply touch the app icon and hold it for moment. When it starts "shaking" touch the “x” and it will disappear. Press your “home” button and the shaking icons will stop). If you're reading this on your device, tap here to access the app download page (or use the search tool in your "App Store" app on your device to find "Waterway Guide Marinas" and download). First time downloading the Waterway Guide Marinas App? The new app was developed by Waterway Guide and TechArk Solutions. I just got a call from an Android user who downloaded the new Marinas app. He alerted me that with the new Marshmallow updates to Android devices that he needed to go into the Android settings and allow permission for location services. So, if you're having issues with the app not knowing where you are, make sure all location services are turned on. By the way, he likes the app because of the Preferences filter and easy telephone call-out button. When I open your app on my Iphone it says "There are no marinas that meet your preferences" Even after I put the length and draft of the boat in and save it. I'm only located in Freeport, Grand Bahama and the app shows me nothing as far as here or Florida. Sorry for the trouble, Danny. If you have the preferences toggle "off" and distance set where you know there are marinas â€“ and still no marinas show on the list, please delete the app and reinstall it...that should fix it.